Is a Democratic Wave Brewing? Now that 2017 is (finally) over, Washington is turning its full focus to the November midterms. With less than 10 months to go before the election, many are expecting a Democratic wave – and some have gone as far as to say they expect a Democratic tsunami. A majority in Congress, even in just one of the chambers, would be a major game-changer for Democrats, giving them the ability to formally check the other two branches, and particularly the White House. There are clearly signs that should give Democrats hope. In 2017, there were multiple special elections on the Congressional level that went heavily for President Trump in 2016 but became toss-up elections less than a year later. At the end of last year, Democrat Doug Jones won the special election for US Senate in Alabama, and Democrats have flipped 37 state legislative seats since the 2016 election. While these results have been promising, anyone on the Democratic side that is sitting back and relying on the wave to happen could be in for a big disappointment this November. This being said, there is no data that, as of right now, points to a relaxing election night for Republican House members. The same can be said for both sides of the aisle when it comes to the US Senate elections. Indeed, regardless of the overall landscape, Democrats were always going to have a tough year in the Senate. The class of 2012 is up for re-election, and while 2012 was a good year for Democrats and President Obama, 2018 has very little growth potential for Democrats and a ton of tough seats to defend. Of the 34 seats that are up, Democrats are defending 26 of them (including the special election in Minnesota to fill out the remaining portion of former Senator Al Franken’s term, which is not shown on the map below). This number is daunting to begin with, but couple this with the states that Democrats have to defend where Trump won (Indiana, Missouri, South Dakota, Montana, Michigan, West Virginia, Pennsylvania, Ohio, Wisconsin, and Florida) a great night would be having all sitting Democratic members return for another six years. On the offensive side, Democrats clearly have their eyes on Nevada. The Silver State is the one state where Hillary Clinton won in 2016 and has a Republican senator up for re-election (Senator Dean Heller). After that the expansion opportunities will likely require some help from the GOP (think Roy Moore, Christine O’Donnell, Todd Aiken, etc.). If Democrats are able to hold all of their incumbents, and win Nevada, that would put the Senate at a 50-50 tie with Vice President Mike Pence casting the tie-breaking vote. If Democrats have an amazing night this November, it would be just barely winning a majority. The odds of taking over the chamber with even a two or more-seat cushion are low at best. On the other side of the Capitol, however, the House is a little more interesting. We still see the most likely outcome is a near even split. The odds might tip in favor of Democrats taking over if the new map in Pennsylvania is upheld, and those odds will increase if there is a favorable court ruling in Wisconsin or North Carolina this year. But even with these unknowns, as of right now, there is nothing pointing to a fifty or sixty seat swing, similar to 2006 or 2010. The reason for this pessimism comes down to which types of voters have been moving over the past year, and an understanding that not all districts are created equal. What kind of voters should we be watching? Since President Trump’s inauguration one year ago, we have seen two key groups emerging in the 2017 elections. These two groups are not only desirable for Democrats, but they will be necessary in 2018 should they want to make the necessary gains to take back the House (and possibly the Senate). We specifically saw the effects of these groups on the 2017 gubernatorial elections in Virginia, along with the special election for US Senate in Alabama. The first key group is people of color. These voters have been a Democratic stronghold for decades; the issue here is not in convincing this cohort to support Democratic but to ensure that there is engagement and a dialogue within the communities to ensure as high a level of turnout as possible. The work for the Democratic Party will be getting this voting bloc to turn out. We saw the effect people of color can have on the outcome of an election in Alabama; the turnout was historically high and definitely affected the outcome of that race. We also saw the effect this group had in the Virginia elections, particularly in Prince William County and the Tidewater region. The second key group are college educated white voters. Unlike voters of color, among white voters, there is a clear divide when it comes to education. The shift among college educated white voters in both suburban Alabama and in key areas of Virginia such as Loudoun County affected both of these elections significantly. While non-college white voters continue to vote strongly for Republican candidates, white voters with a college degree are the main group that has shifted their voting preferences in measurable numbers. Looking at the effect this group had on the outcome of the Virginia governor’s race is especially interesting. Ground zero for these changes was in Loudoun County which has been seeing huge shifts in demographic makeup (the population has more than doubled since the 2000 census), with college-educated white voters making up a larger and larger percentage of the electorate in this Washington, DC suburban county (Loudon County has the 7th highest concentration of college educated residents in the country). These effect are clear in the election results over the past four years, with Loudoun County going from supporting Governor Terry McAuliffe by just 5 points to Governor Northam winning by a 20-point margin there last year. Looking at the race from a statewide perspective, Northam ended up winning over half (51%) of college-educated white voters across the state, a 6-point increase from 2016, when Clinton lost this group in Virginia to Trump, 45% to 49%. As the chart below shows, other groups shifted slightly but typically just by a point or two. A 6-point swing among this cohort is significant, given the fact that they made up 37% of the electorate in 2016 and is by far the largest group when looking at a cross between ethnicity and education. However, as is the case with most cohorts of voters, college educated whites are not spread out evenly throughout the country let alone most states. If you look at a map of results in the latest Virginia elections, you can see a clear pattern in where the concentrations of support where for Democratic candidates on the state legislative level. In fact, the only congressional district that saw significant movement in support toward Democratic candidates was in the 10th District, which was a district that Clinton won in 2016 and the current Republican member of Congress (Barbara Comstock) was already on the “in danger” list. The other concentrations of blue are in districts 2, 4, 8, and 11 which are all represented by Democratic members of Congress already. As mentioned above, not all districts are created equal. Now that we’ve seen the effect the shift of white, college-educated voters can have on election outcomes we wanted to see if, using what we’ll call the Virginia Effect (a 6-point shift among college-educated white voters in favor of the Democratic candidate), we could measure how likely it is that the Democrats can retake the House this November. To do this, we took a look at the racial makeup of each congressional district, along with the portion of each district that has a college degree, and applied this to the performance of Republican incumbents from 2016. In the end, this gave us an estimated 2018 vote share with the Virginia Effect for each Republican incumbent, i.e. what percentage of the vote they will get in November if all things remain equal with the exception of a six-point shift among college educated white voters. Since we do not have district by district exit polls to determine the past level of support, we assigned the statewide results to each district within that state. While this is not the most accurate measurement, consistency felt like the best way to handle the imperfect dataset. Using this scoring system, we then said that any Republican receiving 48% of the vote or less is a Lean Democratic seat, between 48 and 52% is a Toss-Up, and a 52% or higher performance is a Lean Republican seat. 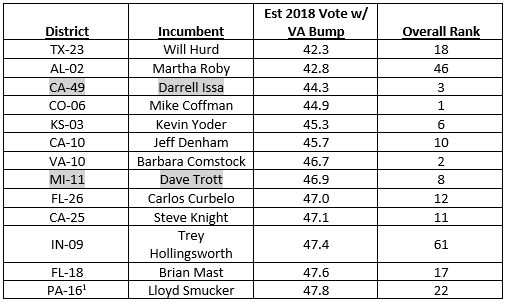 Using the Virginia Effect scoring system, there are 13 Republicans that would receive 47.8% of the vote share or less. This includes Rep. Comstock, along with other Members of Congress who are often noted as vulnerable, include Rep. Mike Coffman in Colorado’s 6th District. Note the overall rank score – we’ll get into this later. Additionally, it’s important to note the sheer number of Republican congressman who have announced their plans to retire rather than run again in November (25 as of the writing of this piece). Two in the Lean-Democratic seats are retiring, Darrell Issa (CA-49) and Dave Trott (MI-11), and three in this next group are calling it quits or moving on to better things as well: Ileana Ros-Liehtinen (FL-27), Lamar Smith (TX-21), and Ed Royce (CA-39). In addition to the 13 Republican seats we’ve labeled as Lean Democratic, there are another 20 incumbents who scored a vote share in the Toss Up category (between 48% and 52%). If we are accepting the Virginia Effect as an absolute definite on Election Day, and assuming that any Republican who wins less than 50% of the vote share will lose, we come up to 21 flipped seats– three short of the 24 seats Democrats need to regain the majority. As mentioned above we also created an Overall Rank score. We know the Virginia Effect isn’t perfect and therefore can’t be taken literally – the impact will vary depending on racial and education demographics, which we don’t know for certain because there are no exit polls by congressional district – so we feel that these measurements need some context. With this in mind, we looked at other factors that could influence the outcome of midterm elections, such as higher populations of engaged voters of color, how well Trump did in a district in 2016, and by how much the sitting Republican member over or under-performed Trump in the last election. We ranked each district using these measurements and then came up with an overall ranking based on the mean ranking of the categories mentioned previously. Using this ranking system, below are the top 24 districts for Democrats to flip, a.k.a. the number of seats Democrats need to win back this year. We’ve talked about most of the seats already, apart from Martha McSally in Arizona’s 2nd district and Mimi Walters in California’s 45th district. And while these two congresswomen are aimed to score more than 52.0% of the vote share and are therefore out of the Toss-Up range base on the Virginia Effect, they are not in a completely safe range. Additionally, 11 of the seats we discussed before and labeled as vulnerable didn’t make it to the top 24 in the overall ranking, so there is certainly an argument for Democrats being able to win back control of the House. That being said, we did not factor in districts that Democrats could lose, and there were 12 districts that Trump won which are currently represented by a Democratic member. All this points to the fact that, yes the House is in play but there is little pointing to a large wave or Blue Tsunami. It is February, and a lot can change but without putting in the work and a coherent positive message is it conceivable that Democrats could end up short of the Majority. It is true that 2017 provided Democrats with the minor ego boost they needed following the outcome of the 2016 election. With these races in mind, it’s plausible to think that a wave might be coming in favor of the Democrats – a party change during a President’s first term in office has certainly happened before. However, no matter how you slice it, right now it looks like it’s going to be close on Election Day. Any Democrats who are laying back waiting for the wave might be sitting in the Section (the area where surfers wait for waves, for those not familiar with surfing lingo... line-up for you east coast surfers) the entire time. If you are a Democrat, it is time to put the work in. If you are a Republican, don’t think of a loss as a forgone conclusion…yet.